Fully revised to cover the 2014 CompTIA Security+ objectives, this is a money-saving self-study bundle with bonus study materialsPrepare for CompTIA Security+ Exam SY0-401 with McGraw-Hill Professional--a Platinum-Level CompTIA Authorized Partner offering Authorized CompTIA Approved Quality Content to give you the competitive edge on exam day. 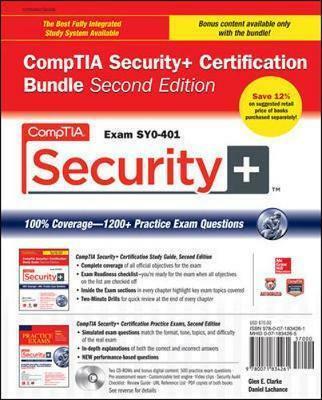 CompTIA Security+ Certification Bundle, Second Edition offers complete coverage of exam SY0-401 and provides a comprehensive self-study program with 1200+ practice exam questions. Pre-assessment tests help you gauge your readiness for the full-length practice exams included in the bundle. For a final overview of key exam topics, you can study the Quick Review Guide. Glen E. Clarke (Halifax, NS) holds a number of industry certifications such as Microsofts MCSE, MCSD, MCSA Messaging, and MCSA Security. He also holds a number of CompTIA certifications, including CompTIA Security+, CompTIA Network+, and CompTIA A+, in addition to the Prosoft Security Analyst (CIW SA) certification. Glen is an experienced trainer, author, and technical editor, and works for GigaBlink Technologies Inc., a training and consulting company located in Dartmouth, Nova Scotia. Glen is also an active member of the High Technology Crime Investigation Association (HTCIA). Daniel Lachance, MCITP, MCTS, CNI, IBM Certified Instructor, CompTIA A+, CompTIA Network+, CompTIA Security+, is a technical trainer for Global Knowledge and has delivered classroom training for a wide variety of products for the past 17 years. Throughout his career he has also developed custom applications and planned, implemented, troubleshot, and documented various network configurations. Lachance was the technical editor on CompTIA Network+ Certification Study Guide, Fourth Edition and other certification books.